Manufacturer of a wide range of products which include garden planter, stone mini planter, stone planter, garden stone planter, garden urn and indoor stone planter. By our rich industry experience, we are committed towards offering wide designer array of Garden Planter that can be used in hotels & resorts. The given garden planter is intricately crafted by our innovative craftsmen by making use of best quality stone & it’s shaping tools in compliance with the market trends. 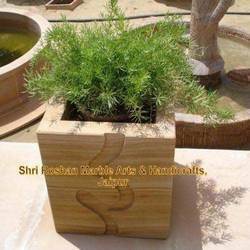 Offered garden planter can be customized as per the specific needs of customers in a given time frame. Customers can easily avail this garden planter from us at affordable rates. Stone Mini Planter offered are highly appreciated for the ultimate finishing work and find suitability for use at home, offices as well as at commercial places. 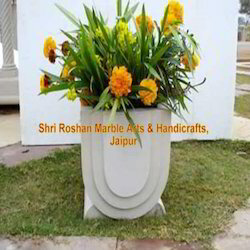 Featuring expert craftsmanship standards, these mini planter options also bear long lasting finish developed in quality marble stones which makes them highly demanded in the market. Some of its features include elegant and flawless finish; designed and developed by experienced craftsmen; made available at competitive prices; lustrous finish that enhances its overall finish. 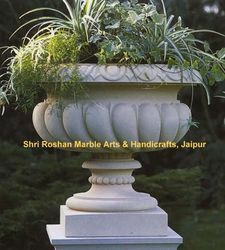 We are the prominent manufacturer, exporter, wholesaler, trader, retailer and supplier of quality assured Stone Planter. This stone planter is appreciated in the market for its beautiful designs and appearance. 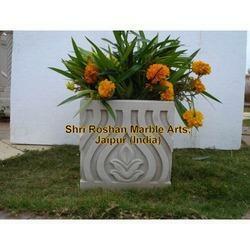 Our stone planter is provided in numerous customized designs options as per the choice of customers. Also, this stone planter is made by using best quality stone & advance shaping & cutting tools in accordance with the market trends. Keeping in mind the latest market requirements, we are offering our clients a broad array of Garden Stone Planter. 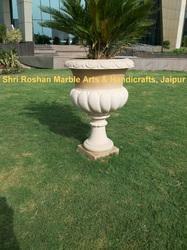 Offered stone planter is available in a variety of sizes and customized options as per the need of customers. This stone planter is crafted from pink sandstone fully carved by single piece & with some latest tools. This stone planter is checked on various quality parameters before being dispatched to our customers in order to ensure optimum standards of quality. We have emerged as a foremost manufacturer, exporter, wholesaler, trader, retailer and supplier of Garden Urn. Our product is praised in the market due to its best finishing & attractive designs. This product is crafted by utilizing utmost quality stone by our experienced craftsmen. Offered product is comes in different designs, sizes and other customized options so as to meet the demand of customers. 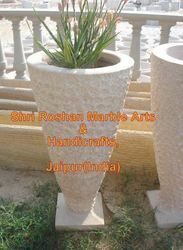 This Indoor Stone Planter as the name suggests can be used in houses in interior as well as exterior. Made form some superior quality sandstone also known as mint or gwalior stone enriched with beautiful carving work done in its exterior. These Indoor stone planter looks very beautiful when colored seasonal flowers planted in them, highly contrasting and very eye catchy. Garden planters are very widely used in Indian houses to maintain the beauty of lawns and gardens. 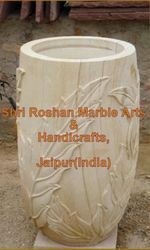 Our company is well known for its regular unique creativity and perfect carving work done in a wide variety of stone or marble products like this Garden Stone Flowerpot. These Garden Stone Flowerpots Looks very beautiful in gardens and houses and lawns etc with some beautiful colored flowers planted in it. This designer urn is a good example of the innovation of our designer team. 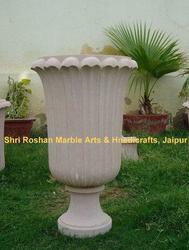 These Designer Urns are made up of Pink Sandstone with a natural pattern on it to make it look very attractive. We have always been a step ahead of our competitors in manufacturing and export of some best quality Designer Stone Garden Planters. These Designer Stone Garden Planters are made from best quality sandstone & carved from a single piece, thus giving it an artistic look. 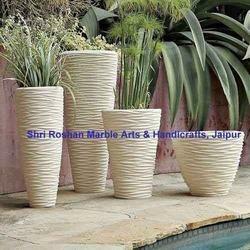 We have some best designed Designer Stone Garden Planters from which you can choose from. This Long round Carved Stone Planter gives it a modern look. 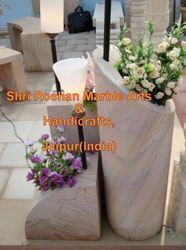 Place it inside your room or keep it in your lobby or just place it in your garden, These Carved stone planters are surely going to be just a point of attraction for you visitors. Looking for Stone Planter ?